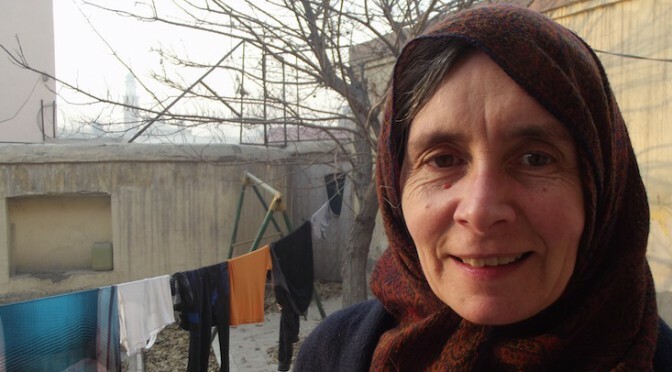 “I didn’t know what to expect in Afghanistan. I knew there’d be men with guns about, and that there would be a lot of visible poverty, addiction and the other marks of a long war on people and the landscape. But I couldn’t imagine what it would be like landing in Kabul, getting a taxi from the airport to the compound and meeting our hosts, the Afghan Peace Volunteers. What I definitely wasn’t expecting was to feel so at home. We landed to a scene like nothing I’ve ever been part of before, a strange mixture of a heavy military presence and the more traditional aspects of Afghanistan. We walked out of the airport past men in various uniforms and crowds of ordinary Afghan people wrapped up in scarves against the thick snow. We had barely stepped into the carpark when were met by Ebi, a friend of Maya’s from her previous trip and by Gulan, who has joined the APV more recently. 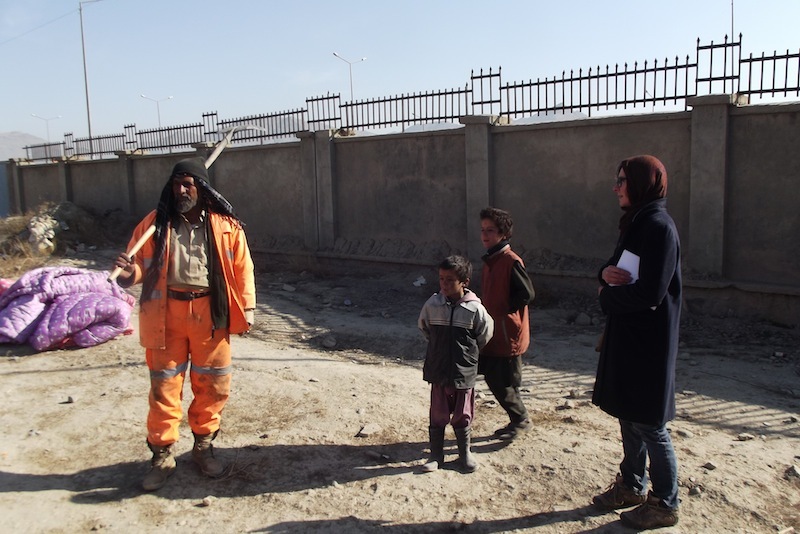 They were so welcoming and friendly that despite its strangeness Kabul felt immediately like the right place to be, even before we had got in the taxi I felt unexpectedly at ease. They took us in two taxis back to the compound where the APV are based. We spent the first sleep-deprived day acclimatising and making friends. There are all the funny little things that make a place seem foreign. They have carrot jam and gigantic fluorescent light bulbs. The room that we’re staying in, which is also the meeting room, is beautiful, there’s a stove to one side that heats the room and provides water for the constant cups of tea, a red carpet and gold cushions and curtains. For lessons and meetings everyone sits around the edge of the room on the cushions, and at night the four of us from England turn the cushions into mattresses and stay snug despite the snow outside. I think the other rooms are less luxurious and we’re getting some guest treatment in having this as our sleeping space. The compound feels like a safe space for a diverse range of people to come and to explore difficult and dangerous issues. There are the volunteers themselves, who are boys and young men from different ethnicities and backgrounds doing deep reflective work alongside the practical projects and campaigning that they run from here. There are women who come to sew quilts and are considering how to set up a business in a way that won’t put them in danger from strangers or their own families. Some of the daughters of the women come to English lessons first thing in the morning along with the volunteers and other students, most of whom are in their young teens. 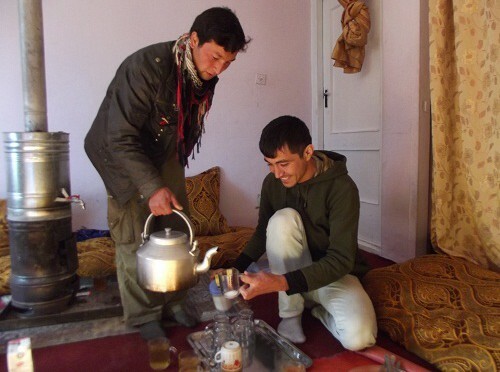 And there are international visitors like us, who come to learn from the APV and to visit Afghan people to hear their stories of everyday life in Afghanistan. We’ve only been here a couple of days but we’ve already visited a refugee camp, a women’s business meeting and a woman who lost two children in a suicide attack. The boys and men of the APV that we’ve been making friends with have their own experiences of bereavement and hardship. It’s startling and horrible to be in a meeting and to suddenly hear about the toll the war has taken on someone who you’ve just been sharing bad jokes and a plate of food with. And it’s never just one tragedy. Ebi, the boy who greeted us at the airport with the friendliest grin I’ve ever seen, who is studying journalism and wants to one day travel to Africa, Mexico and Egypt to witness and support other people’s struggles around the world, told us today in the meeting with the mother who had lost her children that he had lost a cousin in the same attack. Later he told us that when he was six he’d seen his older brother killed in front of his house.